Today's Pi Beta Phi members go to local cemeteries to plant flowers at the graves of their founding members. Jennie's burial site at the Little York Cemetery is close enough, and yet still quite the distance from Monmouth College, to receive flowers from the Monmouth College Chapter on occasion. The sisterhood and camaraderie that Pi Beta Phi celebrates on Founder's Day echoes the sentiment that Jennie lived her life by. The sorority of I.C. Sorosis was founded on April 28th, 1867. The change from I.C. Sorosis to Pi Beta Phi has not affected their founding which is why Pi Beta Phi celebrates their Founder's Day on April 28th. This celebration welcomes all members to come together, whether in college or having graduated, and attend a ceremony. This ceremony allows members of all generations to come together and spend the day celebrating their opportunity for sisterhood and reflect upon the impact the founding members have had in their lives. 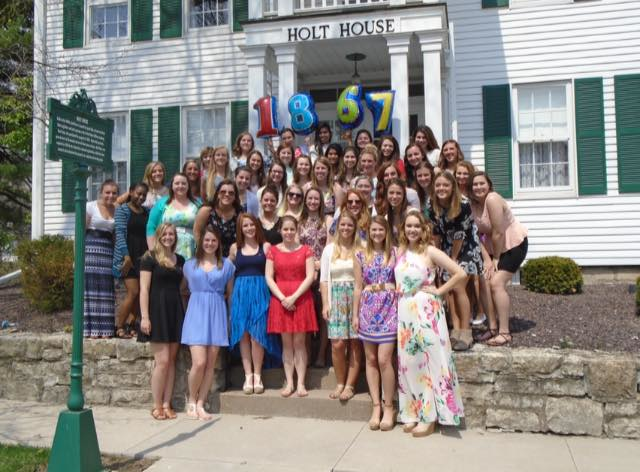 The Monmouth Illinois alpha chapter of Pi Beta Phi celebrated 148 years of sisterhood on April 28th 2015. The members are proud to be able to continue the legacy that their 12 founders started as well as hold their weekly chapter meetings in the same building that the sorority was founded, the Holt House. Amber talks about how the members of Pi Beta Phi honor their founders each year on the day the contract was signed.